Apple has voluntarily stepped forward to share the initial cost of improving working conditions at Foxconn factories in China. Both companies have come under fire in recent months with regards to what some deem to be poor labor conditions in the factories that produce iPhones and iPads. 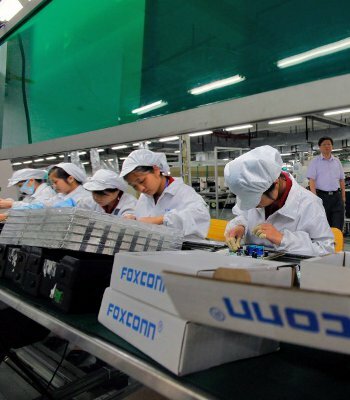 Foxconn president Terry Gou said that he feels the criticism his company has received over working conditions is unfair and that they are spending heavily to fight the negative perception. As such, he believes that improving factory conditions isn’t merely a financial cost but a competitive strength. As Engadget says, the chief feels that both his company and Apple will be rewarded through an overall happier staff. Gou didn’t elaborate on how much the initial improvements would cost, what exactly was being improved upon nor did he indicate if it would be a 50 / 50 split or some other ratio. Both companies have been tackling the issue head-on in a number of ways. Foxconn raised employee wages by 16 to 25 percent earlier this year, marking the third pay increase for staffers since 2010. The two companies came to an agreement in March that would see Foxconn hire tens of thousands of additional workers to cut back on the amount of overtime existing employees are given. Apple became the first technology company to join the Fair Labor Association, resulting in subsequent audits of several Foxconn factories in Chengdu and Shenzhen. Initial findings from those audits suggested that working conditions were above average but there were still areas that could use improvement.